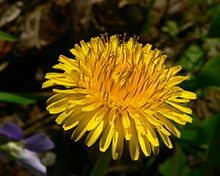 Dandelion formula supports the liver, gallbladder and stomach meridians. It is a powerful support for when one experiences feelings of anger. Taraxacum /təˈræksəkʉm/ is a large genus of flowering plants in the family Asteraceae and consists of species commonly known as dandelion. They are native to Eurasia and North America, and two species, T. officinale and T. erythrospermum, are found as commonplace wild flowers worldwide. Both species are edible in their entirety. The common name dandelion (/ˈdændɨlaɪ.ən/ DAN-di-ly-ən, from French dent-de-lion, meaning "lion's tooth") is given to members of the genus. Like other members of the Asteraceae family, they have very small flowers collected together into a composite flower head. Each single flower in a head is called a floret. Many Taraxacum species produce seeds asexually by apomixis, where the seeds are produced without pollination, resulting in offspring that are genetically identical to the parent plant. Dandelion is the flower for emotionally strong and straightforward people who are happy, caring, cherishing and who respect and value another person's point of view. When traumatised they are prone to sudden outbursts of heated and irrational or violent anger. Dandelion lessens the impact of the overbearing ego and softens attitudes. It is particularly valuable to calm anger and helps to deal with loss of temper and also calms the victim of someone who loses their temper. Power, courage, cleansing, anxiety, anger, fragility and victim of anger. Elimination of heavy metals, chemicals, environmental poisons. Antidotes Mercury when combined with FF11. The Liver is affected by anger or victim of anger. The Gallbladder is affected by suppressed anger. The Stomach is affected by fear and eating incorrectly. Assimilation of vitamin B12 and the mineral Potassium. Uptake of Amino Acids L-Valine and L-Glutamine. Emotional level: Happiness, Trauma: Frustration and depression. Overanxious, overprotective and hypochondriac. Emotional level: Emotionally strong and straightforward. Trauma: Emotionally polluted and liverish. Short-tempered. Grumpy and bad-tempered. Emotional Level: Calm and expressive, highly charged and successful. Trauma: Tension, anxiety, highly strung, neurotic and unstable. Emotional: Very helpful to encourage disciplined attitudes. Supports team work. Particularly beneficial for people who are attempting a regime whether of training, exams or diet. It helps to clear the mind. Emotional cleansing. Spiritual: This harmoniser protects against psychic attack. It is very etheric and is most beneficial for anyone seeking communion with their higher self. The papain enzyme from the fruit pineapple is well documented as a digestive enzyme for all acidic conditions; Pineapplewort resembles pineapple both in appearance and smell as well as in vibration. FRAGILITY/ANOREXIA. Senses: Sound and movement. Emotional: Fragile and gentle with very special qualities. Easily offended and wounded and very sensitive. Trauma: Blocked and polluted with subconscious memories of the past. Deep trauma as a result of unacknowledged past experience. Punishing oneself subconsciously particularly with eating disorders such as bulimia and anorexia. Spiritual: Give recognition to yourself knowing that you have already been forgiven.